Peter Houston feels Dundee United are still stronger than Dundee despite the Dens Park club's resurgence. The former United manager, now at Falkirk, expects Jackie McNamara's men to edge Tuesday's opening Dundee derby of the 2015-16 season. "It's going to be a cracker," Houston told BBC Radio Scotland. United won three league meetings against their city rivals during the 2014-15 campaign but Dundee recorded a memorable 3-1 victory in the other Premiership meeting - Dundee's first derby win in over a decade. However, Houston - who managed United from 2009 to 2013 - believes the Tangerines will have the upper hand in the first head-to-head of this season. 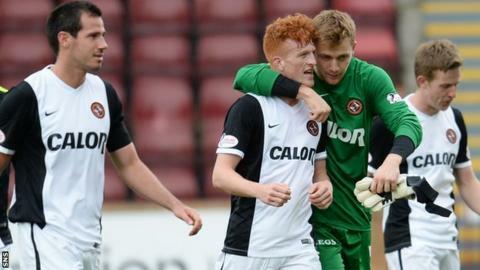 "It's at Tannadice and I don't think Dundee have won there for a long, long time," he said. "I know I'm the ex-United manager, but I think United might have too much for Dundee tonight. "Over the past couple of years with Dundee coming back up again, it's certainly whetted the appetite of everybody in Dundee. The fans are right out in numbers and tonight will be no different - the atmosphere will be magnificent." Meanwhile, Houston added his opinion to the furore surrounding John Collins' comments. The Celtic assistant manager said players in Scotland are "not clever enough or quick enough thinkers" to punish his team when attacks falter. "I think he's used his words wrong," said Houston. "Jackie McNamara's come out with a great statement that three of the Dundee United players have now played in the Celtic first team and in the Champions League. "I think it's been taken out of context a bit. I see the point John Collins is making and I see the point Jackie McNamara and Derek McInnes have come back with. I think, John, if he used his words a wee bit differently, he would probably get his point over properly."